In this thrilling sequel to The Shroud Conspiracy, a child cloned from the blood on the Shroud of Turin has the potential to save the world—or destroy it for good. When a fallen angel is mistakenly resurrected from the blood of an evil “Watcher” taken from the Shroud of Turin, the fiend’s first gift to the world is an unstoppable plague. Dr. Jon Bondurant, the forensic anthropologist and avowed atheist, joins with devout Domenika Josef to bring another child of the Shroud into the world to save it, this one borne of DNA believed to be that of Jesus Christ. Can this child be the answer to their—and mankind’s—prayers? His parents are uncertain just who the child is or what he will become, but when he starts demonstrating remarkable powers to heal, they begin to understand that whatever he is, he is not of this world. Might he bring miracles to the world when it needs them the most? Or has science given mankind a tool with which it will destroy itself as the tempting power of the Watcher unfolds? 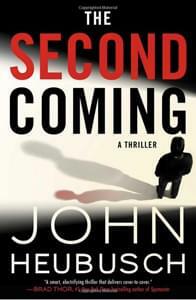 The Second Coming: A Thriller by John Heubusch, available at Amazon.com.